2.Built-in 2.4G nano receiver(inside mouse battery slot) compartment for storage, easy to carry around. Step 1: Take out the 2.4G nano receiver , insert 2 AA batteries for mouse and 2 AAA batteries for keyboard (Not include). 1.Power off all other 2.4G devices in your room, make sure both the keyboard and mouse are "off" . 【COMPACT KEYS AND CONVENIENT】 Small Size Main Keyboard And Number Keypad With 102 Keys, So The Length Is Shorter Than Full Size Keyboard To Save Desktop Space. Wireless Design Give You a Cleaner Desktop, And Get Rid Of The Troubles Caused By The Cable. The Longest Use Distance Up To 10m. 【WHISPER MUTE】 Lowest Volume Keyboard And Whisper Mute Mouse Bring Quiet Environment. Suitable For Home, Library, Conference Room, Café And Other Occasions. 【FASHION AND COMFORTABLE】 Silver, Gray And White Color Design For a Comfortable Visual Experience. The Scissor Key Metal Plate And ErgonomicsDesign, Let You Use It For a Long Time With Good Moods. 【LARGE COMPATIBILITY】 This Keyboard Is Suitable For Windows, XP, Mac Os, Vista, Linux And Other Systems, But Not Suitable For IOS System. The 12 Hot Keys On The Keyboard Are Compatible Windows System Only, Other Systems Are Compatible Some Parts Function. 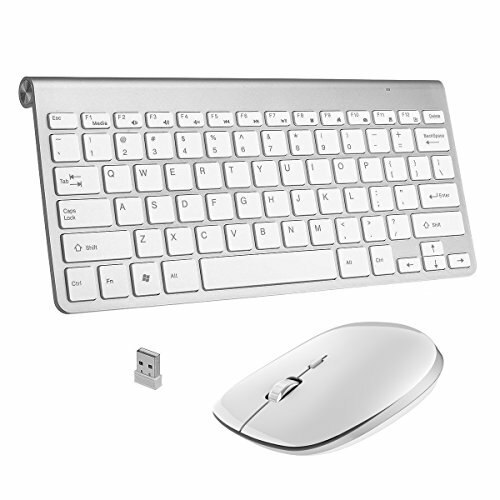 【EASY TO USE】The Keyboard And Mouse Combo Have a USB NANO Receiver, You Just Plug It On The USB Port Of Your Device, After The Device Identify The NANO, You Can Pairing The Keyboard And Mouse With Your Device. If you have any questions about this product by SINCO, contact us by completing and submitting the form below. If you are looking for a specif part number, please include it with your message.